"The day we see truth and do not speak is the day we begin to die"
Well the status quo in Pima County wants this case - and the truth - to die. The case in question is “We the People” attempt at court-ordered reforms seeking “prospective relief” so they cannot cheat in the future. 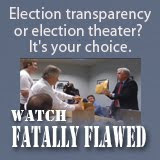 Facts are, Pima County election process – a process involving election software the county has already admitted and situated in early cases (we won) as “fatally flawed” in a county that produced one of the most visibly hacked elections the country has ever seen. As more evidence continues to surface demonstrating with the highest degree of statistical probability that the 2006 RTA election was rigged, Judge Kyle Bryson upheld his previous decision to grant Pima County's motion to dismiss. "This is groundhog day moving us once again" as Bill Risner stated to Judge Kyle Bryson in the hearing that occurred on August 13th of this year. This is an accurate statement as the Libertarian Party is now forced to make the same appeal over the same arguments to the same appellate court. “The goal of this lawsuit is to protect the “purity of elections” in the future, starting with the 2012 elections. Years of public records suits have shown us what's wrong with this county's elections process, computer systems and managers… …The most important legal and factual building block of this lawsuit is the agreed upon fact that it is very easy to cheat with our election computer software. The ease of cheating may be counterintuitive, especially among those least familiar with computers, but it is a fact. The ease of cheating may be a surprise even to those who are familiar with computers but whose familiarity was derived from securely developed programs. Our election computer system has quite simply been built to cheat and, at least for that goal, it has succeeded.” - Attorney Bill Risner, excerpt from statement of facts filed 1/12/12. Since 2006 we’ve won 3 major cases so far revealing how the process in Pima County works despite the county spending over a million dollars to block public records access alone. We filed this case several years ago to actually fix the problems found in that public records trial. 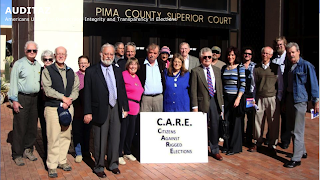 In 2009 Pima County judge Harrington threw the “reform case” out but both the state appellate and supreme courts said otherwise – that we have a right to prove that the election process in Pima County is broken and ask the court for mandated reforms even if they are above and beyond state law – because under the AZ Constitution we have a civil right to fair elections and if state law is inadequate to achieve that, the courts can step in. Before any court orders affecting election procedures are issued, the hearing needs to complete the fundamental tasks ignored by Attorney General Terry Goddard. The court must allow for the actual audit of the ballots and a forensic examination of the ballots. In fact, if the audit and forensic exam do not turn up evidence of foul play, the court does not have sufficient cause to issue orders for prospective relief. That outcome would end the case. So what are they afraid of? Why is Pima County the primary obstacle to this investigation? We marvel at this remarkable moment in time. The inescapably simple resolution that Pima County avoids leaves everyone endowed with basic cognitive skills with the uncomfortable realization that Pima County has been caught cheating and they are staving off the inevitable with taxpayer's dollars. You may hear complaints by Pima County Administrator Chuck Huckelberry about the costs of litigation and the time it is taking to resolve this issue, but responsibility for the costs of litigation rests squarely with him. Under his supervision, Pima County spent at least 1.3 million dollars in litigation in their failed attempt at resisting disclosure of public records. They even presented legal arguments trying to block a court order protecting the ballots while at Iron Mountain's storage facility (once it was discovered that those ballots had no real protection since 2006). It's important to keep in mind that Huckelberry is merely the figurehead working on behalf of the corporate interests while preserving the tertiary image of public service. His departure would ultimately bear little significance if the overarching structure of Pima County remains in tact. We fail to see the logic behind Pima County's refusal to resolve this issue in an expedient and efficient manner. 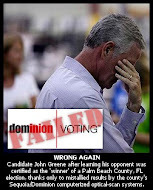 Regardless of the severity of the crime, it's time to clean up the elections department. Pima County reserves for itself the privilege to cheat in elections and those who dare to call for sufficient election transparency are punished. Pima County is solely responsible for all the legal foot-dragging, but the courts whose budgets are overseen by Chuck Huckelberry still make the plaintiff (who where victors in the last three rulings) pay for the storage costs of the ballots at Iron Mountain's facility. Bill Risner was stiffed court fees despite finally obtaining access to the poll tapes after Pima County dragged their feet in a year's worth of litigation. This war of cost and attrition hurts election integrity, but it is Pima County that's looking desperate regardless of the size of their public relations team. After prevailing in both AZ Court of Appeals and Supreme Court by late 2011, we were assigned a second local judge (Kyle Bryson) following those wins, but he threw us out on the same basis as the Harrington in 2009 decision by claiming he didn't have the ability to create the reforms we were asking for...in complete and highly unusual rebellion against three appellate court judges and five state supreme court judges. After judges allow for a little tarnish to their reputations on behalf of the growth industry, they pass the buck to another fresh, less-tainted judge. In this case, Judge Kyle Bryson is being very generous to his fellow judges by the extent to which he allows his reputation to be trashed fighting this constitutional issue involving elections. This is now turned into an outrage. ‘We the people’ have a right to our day in court and fair elections, and a corrupt county is blocking those rights at all branches of government. Sadly, it’s what we expected from a court system that works to protect the status quo in Pima County because that court system is Pima County. Yes, we’re going to appeal again. 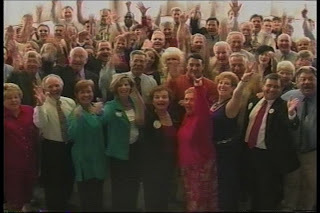 Link to our last appeal[i]: “Opening Brief to Arizona State Court Of Appeals Div 2. Seeking Prospective Relief to Protect the Purity of Future Election Results?